We had a great walk on a gray morning at Laurel Hill County Park on Tuesday. Highlights on the NJMC/BCAS walk included Great Cormorants, a dozen Black-crowned Night Herons hanging out along the Hackensacxk River, and two Common Ravens perched just below last year's nest. We'll post more pix and the full list tomorrow. Ray Gilbert saw the Northern Shrike at 4:15 p.m. today by the first high-tension-wires tower on DeKorte's Saw Mill Creek Trail, coming from the carillon area. Tomorrow is "No Shrike Wednesdays." The shrike put that clause in his contract when he signed on for another month. Mike Newhouse of the Meadowlands Commission had an Orange-crowned Warbler and White-crowned Sparrow Tuesday before noon at Mill Creek Marsh in Secaucus — also had Red-shouldered Hawk on Disposal Road a bit later. John Slattery writes: "The reports that I have read state the Northern Shrike is expanding its territory beyond the Carillon area. "I saw the shrike further south on Disposal Road approx. 200 feet to the west of the rear of the Maintenance Shed (behind the Observatory) at DeKorte Park this afternoon. Doug Morel writes: "Took a midday visit to DeKorte today and managed a good variety of ducks, a couple raptors and my target, the No. Shrike (2nd attempt). 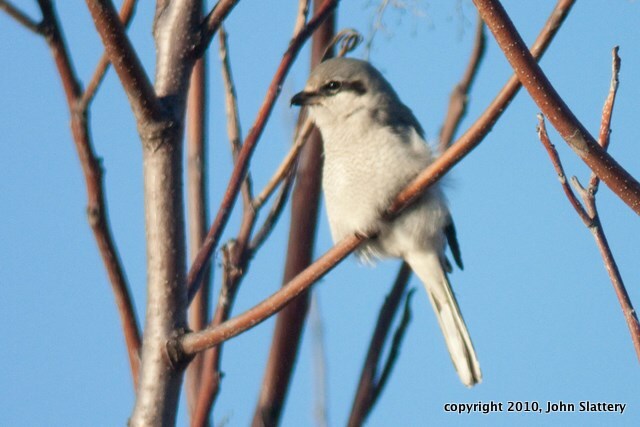 "The Shrike was observed singing away in treetops along Disposal Rd. not far fron the back end of the Commission's garage behind the Observatory. 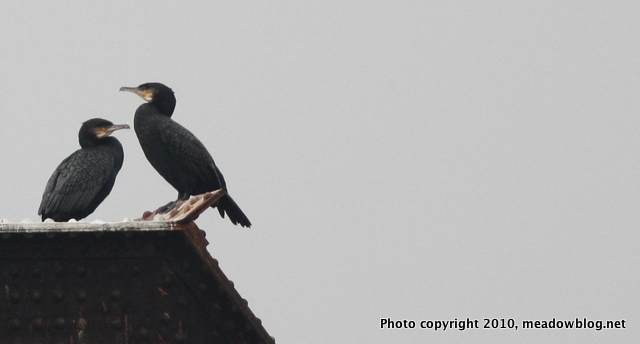 Thanks go out to another birder who directed me to it's location as I approached it. Heard song before sighting the happy bird. 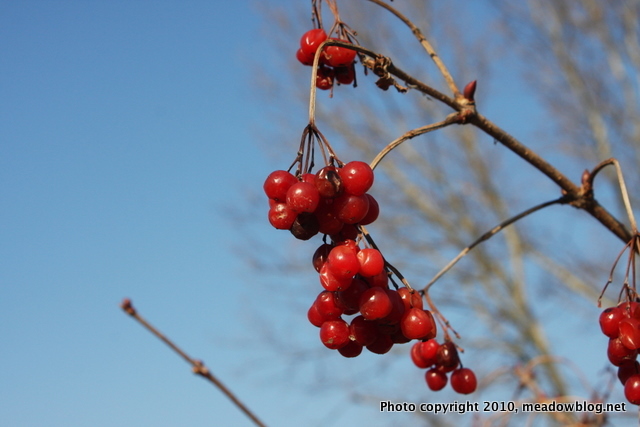 We saw these beautiful berries in DeKorte Park, and wondered why the birds have not noshed on them. What kind of berries are they? Click "Continue reading …" immediately below for the answer, and more about these berries.